Announcing a Revolution in Tanning Without The Sun. The sunless tan: It is truly the one fashion that never seems to go out of style. Celebrities love it, doctors recommend it, and it has been the secret to a youthful glow for years. In 1923, French style icon Coco Chanel “accidentally” developed a tan while on her yacht in France. She later admitted that she simply stayed in the sun “tad” too long. But it was too late, her disclaimer failed to keep the look of tanned skin from catching on like wildfire. Almost 100 years later, tanned skin and that healthy sun kissed glow is more popular than ever. In fact, most people now find that they like a bit of a healthy glow all the time, not just at the peak of swimsuit season. There is no denying a suntan’s amazing ability to hide skin imperfections, diminish the appearance cellulite, conceal broken blood vessels, spider veins, varicose veins, and wrinkles. In fact, a tan can quickly and easily make you appear 10lbs thinner. But, we also know that the suns deadly rays cause premature aging, wrinkles, sunspots and in many cases skin cancer. Getting a tan from the sun is really no longer an option. So, is it possible to get that gorgeous and natural looking sun kissed appearance without the suns harmful rays? Look, we’ve all been embarrassed by using a sunless tanner that left us orange, streaky, stinky or greasy and swearing that we would never use a sunless tanner again. Finally, a new generation of sunless tanners has arrived; delivering flawless and natural looking, streak free tans. Modern research has recently provided us with dramatically improved ingredients and highly effective formulations. These newest formulations of sunless tanners are painstakingly researched and precisely blended to provide a very natural and healthy looking tan. The days of the “fake tan” are gone and you can finally get an unbelievably realistic tan from these newest sunless tanners. But beware, not all of these new sunless tanners are created equally. Say goodbye to the sun and hello to the PERFECT sunless tan. TanPhysics is the hands down winner by a mile. This innovation in skin care saves you time and money by combining the highest quality tanners with anti-aging skin moisturizers found only in the most exclusive products. The result is a tan so natural and skin so rejuvenated that you will never use another tanner again. This product offers a tan that looks like you got it at the beach, it is easy to use, smells great and gives great results every time. It is a fool proof way to a safe beautiful year-round tan and is all we have used since we discovered it. Added bonus: TanPhysics can be purchased as a “system” that includes a pre tan exfoliator, the tanner itself and then a vitamin enriched, moisturizing tan extender. This trio is perfectly formulated to work together as a skin care system to offer maximum tanning and skin care in one. This company has really developed a breakthrough in skin care that we couldn’t find anywhere else. Definitely worth a try! Cons: It is only available online and recently TanPhysics has become so popular that it is often out of stock. The demand is exploding so when you see it is available we recommend buying a few bottles at a time. Pros: This product provided one of the most natural color tans compared to many others tested. The color went on easily and lasted for a few days before we needed to reapply. The smell was not overly strong or offensive. We like this because of its natural result and ease of use. A distant second to our #1 choice, but a decent alternative. Cons: This gel goes on clear so it is hard to tell where you have put product, sometimes leading to a streaky look. Also, it takes forever to dry making it tough to use if you are in a rush. It leaves a bit of an oily feel on the skin. If you are prone to oily skin or break outs, this may not be the best choice for you. Pros: Its delicate iridescence and slight bronze tint give immediate color, and its rich oils leave your legs silky (but not sticky). Cons: The color is quite dark so may not be good for lighter skin tones and the heavy balm may clog pores. We broke out a bit on our back and chest when using it. This may be a good choice if you want something just for legs. Pros: The mouse easily spreads onto the skin and sinks in pretty quickly. It has a nice sheen that helps you to see where you are applying it and you start seeing results in about a day. The tan is a good color but streaky, making it look less realistic. Cons: Has a pretty strong “tanner” odor and even though you can see where you are applying it, you still end up with quite a lot of streaking that only gets worse with more applications. Also, the foam seems to leak out of the top especially if you are travelling with it, so make sure to keep the top and put it in a sealed plastic bag. Pros: This product goes on quickly and dries quickly keeping smearing or staining of clothes to a minimum. The deep brown color helps you to see where you are spraying it. It gives decent color that lasts about 5 days. Cons: The spray smells like pure alcohol going on and dries your skin a bit due to its alcohol content. Although it is an aerosol spray and they say you don’t need to rub it in, if you don’t you will be a streaky mess. We got better results by rubbing in fully and then washing hands. Make sure to clean under your finger nails VERY well or else they will turn brown. TLT Inc. sponsors this website and represents realtanphysics.com. Writers are compensated by TLT, Inc. Warning: For external use only. Does not contain sunscreen and does not protect against sunburn. Repeated exposure of unprotected skin while tanning may increase the risk of aging, skin cancer, and other harmful effects to the skin even if you do not burn. The statements made on this website have not been evaluated by the Food & Drug Administration. These products are not intended to diagnose, prevent, treat, or cure any disease. The name has been changed to protect the privacy of the writer. The information contained in this Website is provided for general informational purposes only. It is not intended as and should not be relied upon as medical advice. The information may not apply to you and before you use any of the information provided in the site, you should contact a qualified medical or other appropriate professional. If you utilize any information provided in this site, you do so at your own risk and you specifically waive any right to make any claim against the author and publisher of this Website and materials as the result of the use of such information. 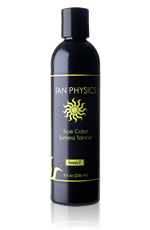 Tan Physics owns and distributes True-Color sunless tanner. The third-party product names, logos, brands, and trademarks shown on this website are the property of their respective owners. These companies are not affiliated with The Logic Team, Inc. These third parties do not sponsor or endorse this website, its content, or its owners.